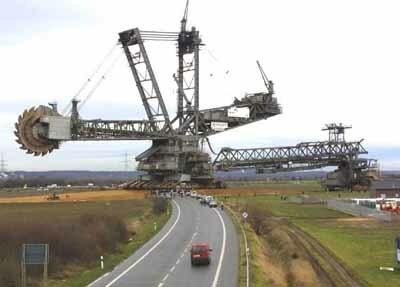 This is the largest digging machine (or trencher or rotating shovel) in the world . It was built by Krupp . The machine is 95 meters high and 215 meters long (almost 2.5 football fields in length) Weight is 45,500 tons (that's equivalent to a bumper to bumper line of jeeps 80 miles long) Maximum digging speed is 10 meters per minute . Can move more than 76,000 cubic meters of coal, rock, and earth per day .